Poinsettias are one of the most symbolic icons for the holiday season. 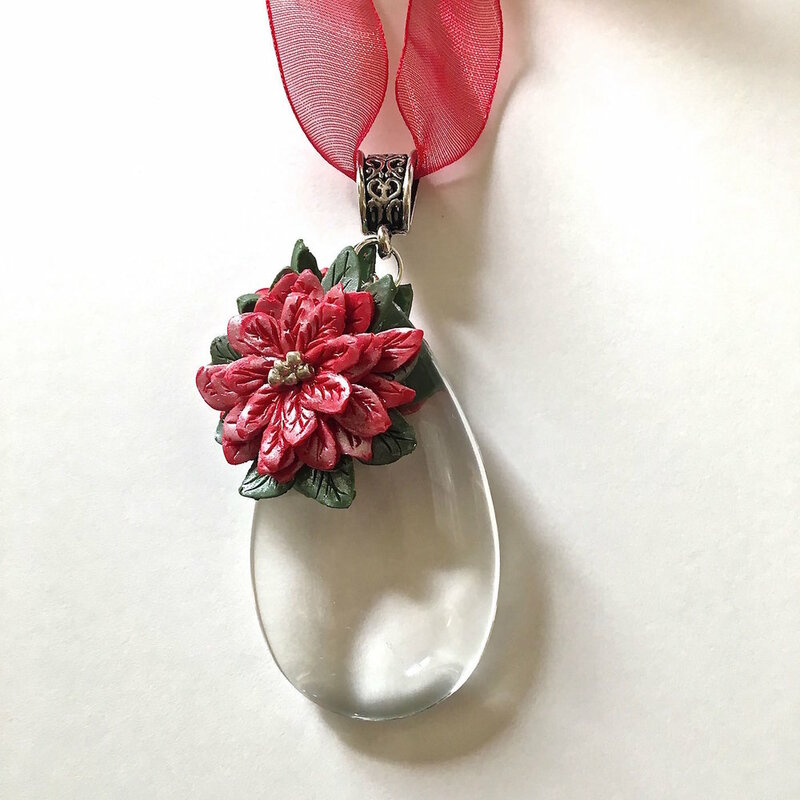 In this project they are made from polymer clay and paired with an elegant tear drop shaped crystal, resulting in an impressive addition for your Christmas tree. The 2.50" long ornament makes a bold statement with it's silver seed beads at the center and silver bail suspended on a sheer red ribbon. Two poinsettias hug the edge of the crystal to create a double sided ornament. The template for the poinsettia is included with the instructions. step 1 - Download and print out the poinsettia template on card stock. The template contains the shape in four different sizes. Cut out each shape with a craft knife. step 2 - Roll out green and red clay on the clay conditioning machine’s #3 setting. step 3 - You will be creating two poinsettias, one for the front of the ornament and one for the back. Each consists of a green base with three red layers stacked on top. Use the card stock stencil to cut out two green clay pieces from the largest shape. Cut two red clay pieces for each of the three remaining shapes. step 4 - Create veins on all the shapes with a fine tip sculpting tool. step 5 - Add white mica powder to the clay using your finger or a daubing tool. step 6 - Stack the largest red clay piece onto one of the green ones. Don’t match the shapes. Rotate the top piece so that the points of the red leaves fall between the green leaves. step 7 - Stack the next largest red shape on top and then the last and smallest one. Press into the center only so the pieces will bond to each other. Do not push the pieces flat against each other. Now create a second identical poinsettia. step 8 - Slip a 8mm jump ring into the hole in the crystal. step 9 - Attach another jump ring and a bail. step 10 - Apply Liquid Polymer to the backside of each poinsettia. Add the polymer only on clay that will be touching the glass. step 11 - Place one poinsettia on the front, side edge of the crystal and one on the back, matching them and having the green leaves extend out past the crystal. Lift the leaf edges slightly for a truly dimensional flower. 12. Place the ornament on a soft cushioned surface like fiberfill. It will “nest” the ornament and not leave a shiny finish on the clay. Bake the piece at 275 degrees for 30 minutes. step 13 - When the clay has cooled, drop a bit of E-6000 into the center of each poinsettia and attach silver seed beads. Positioning the bead on a straight pin and sliding it into position will prevent the bead hole from landing face up. step 14 - Thread a red ribbon into the bail to hang the ornament.